Bill Wagner fishing for catfish. It’s an early, but warm spring morning under a clear sky, around nine in the morning. The birds are singing and enjoying a spring feast. In fact, everyone on the Jordan River Parkway at the Winchester trailhead has spring fever. You can see it in their faces, which is why I asked for their opinion on the Parkway. Seraphina Jones on the Winchester trail. “I feel blessed to live in the city and still have all of this beauty around me,” Rebecca said. This opinion is shared by many others. “It’s peaceful and beautiful and there’s no traffic. That’s the biggest reason to come,” Seraphina Jones says. For many, the biggest reason for coming is nature. Dave Brown, a regular, says, “It’s a nice, natural setting. I’ve seen deer, foxes, and all kinds of animals along the trail,” he says. Bill Wagner, a retired nature photographer, says he’s there for the fishing. Several others have come for bird watching, binoculars in hand. They point out the many species of birds along the Parkway. 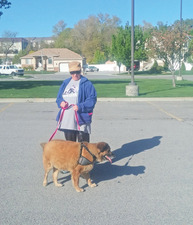 Pat Mongiat and Mia on the Parkway for their daily walk. Lori Pond on her way home. There seems to be no lack of reasons behind why people love the Jordan River Parkway, or why they choose it for exercise and their recreational and nature walks. A few noted that they feel safer on some parts of the Parkway than others and that some areas still need a little dressing up. Other point to the empty doggie bag dispenser, but none of it stops them from coming. All in all, people feel the city fathers and the Jordan River Commission have done a great public service with the Parkway. Restoration and is ongoing all the time along the Parkway spring conservation activities are coming up in May. They include: Get into the River – Conservation Day on Thursday, May 14, and Get Into the River – Festival Day on Saturday, May 30. All are encouraged to join with others to help preserve, maintain and restore the 51 mile long park.